#ECG Class is an educational blog which runs alongside Twitter. A new ECG "quizz" is launched most Monday evenings, in term time. Cases are generally aimed at Primary Care. All scenarios are completely fictitious and theoretical, but based on commonly occurring presentations in General Practice. This is an educational site, intended for healthcare professionals and shouldn't be construed as patient advice. Please use the Hashtag #ECGclass on Twitter, if you want to ask the patient any questions, or request any further investigations. Alternatively, please join in discussion and leave comments below. Remember there are no right or wrong answers! ECG interpretation is often open to debate, and will usually evolve and change as new information becomes available. Everyone's opinion is valid, and useful for others, as the evolution process takes place. Together we will try and form an interpretation based on the trace, and information, we have in front of us. Don't worry if you disagree - shout up and share your thoughts - the diagnosis is often arguable on the basis of a 12 lead trace, and may only become more obvious when a longer rhythm strip is available. A 64yr old lady comes to see you, complaining of breathlessness on minimal exertion over the past 6months. She denies any chest tightness or discomfort. She has no past cardiac history, and has always enjoyed a healthy lifestyle. Examination in unremarkable. She appears slim and healthy, is normotensive, with a regular pulse rate of 80 bpm, and no murmurs. You arrange some routine bloods, which are normal, and an ECG. Her serum BNP comes back at 38. Inferior myocardial infarct, age undetermined. Lets take each of these statements in turn. Yes. We're happy with the machine's analysis that this is Sinus rhythm. Q2. Can you see the multifocal ventricular extrasystoles, or the run of ventricular extrasystoles? As far as the first statement goes, there are no isolated dysmorphic beats that resemble a ventricular ectopic. (If you need to refresh on the criteria and appearances of VE's, then take another look at the All about VE's class. As for the "Run of ventricular extrasystoles" - this is of course, it's referring to lead V6. But what about this? Remember, that each 'column' on an ECG trace, records the heart rate at the same moment in time for all 3 leads in that column. So the first column simultaneously records the view from the limb leads (I, II and II). The recording will then switch to the second column, which in turn records simultaneous beats in the Augmented limb leads (AvR, aVL, avF). The third column records V1, V2 and V3 simultaneously, and the fourth records V4,V5 and V6. Whilst the heart rate and rhythm might well change between columns, within each of the columns it should always remain the same. So, how could a run of VE's appear in V6 but not in V4 and V5? The only explanation for the anomaly in V6 is artefact. Mostly likely the V6 badge was knocked, or lost contact. We are not concerned about this pattern at all! Q3. 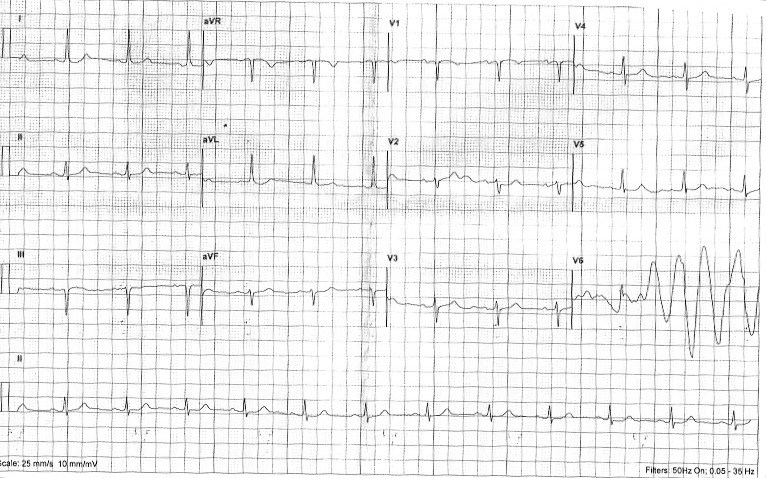 Is this ECG consistent with an Inferior MI? Aha. We have now reached the real point of this ECGclass. How often do we see a computer generated report "Inferior infarct cannot be ruled out" or "possible anterior infarct, aged undetermined". This is a very common reason for otherwise well patients, or those with clearly non-cardiac chest pain, to be referred for a cardiology opinion. This can cause unnecessary alarm for the patient. 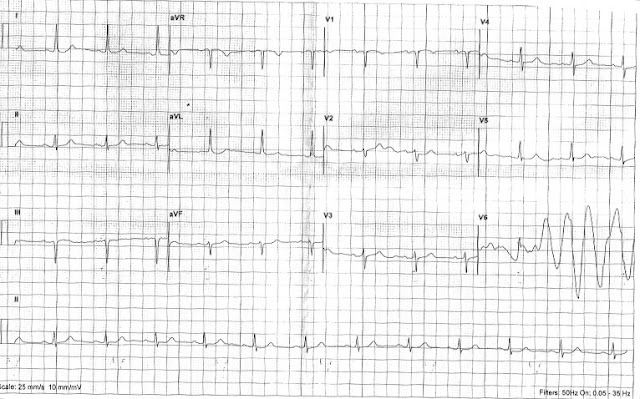 In short, no, this ECG is not suggestive of an old MI. In this lady, once I'd ruled out possible angina (by taking a more detailed history), I'd be looking for other, non-cardiac, causes of her breathlessness. Please see next post for Criteria for pathological Q waves.